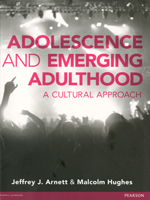 Adolescence and Emerging Adulthood is an innovative and exciting European adaptation of Jeffrey Arnett’s hugely successful and groundbreaking US text of the same title. The book combines the most significant approaches and ideas in developmental, social and behavioural psychology to produce a comprehensive picture of what it means to experience adolescence today. Packed full of illustrations and features including a focus on youth in the media, professional practice and thinking critically, this is an essential resource for anyone studying or working in the field of childhood, youth and adolescence.